At the administrative level,2 antitrust law and practice in Brazil is governed by Law No. 12,529/11 (Competition Law), which entered into force on 29 May 2012 and replaced Law No. 8,884/94. The Competition Law has consolidated the investigative, prosecutorial and adjudicative functions into one independent agency: the Administrative Council for Economic Defence (CADE). CADE’s structure includes an Administrative Tribunal for Economic Defence (Tribunal) composed of six commissioners and a president, a Directorate-General for Competition (DG) and a Department of Economic Studies. The DG is the chief investigative body in matters related to anticompetitive practices. The Tribunal is responsible for adjudicating cases investigated by the DG: all decisions are subject to judicial review.3 There are also two independent offices within CADE: CADE’s Attorney General’s Office, which represents CADE in court and may render opinions in all cases pending before CADE; and the Federal Public Prosecutor’s Office, which may also render legal opinions in connection with all cases pending before CADE. 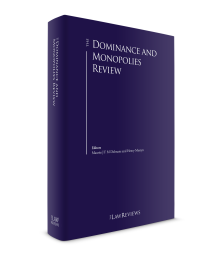 The first Brazilian competition law dates back to 1962, but it was only in the mid-1990s that the modern era of antitrust began in Brazil. Among other reforms, in 1994 Congress enacted Law No. 8,884, which governed Brazil’s administrative antitrust law and policy until 2011. From 1994 to 2003, the Brazilian antitrust authorities focused primarily on merger review, and substantial resources were devoted to the review of competitively innocuous mergers. In 2003, the Brazilian antitrust authorities promoted a hierarchy of antitrust enforcement and ranked hard-core cartel prosecution as the top priority, making use of investigation tools such as dawn raids and leniency applications. A more recent development in Brazil’s competition law enforcement is related to the increasing number of abuse of dominance cases, which is first and foremost a symptom of a system that is no longer in its infancy. The basic framework for abuse of dominance in Brazil is set out in Article 36 of the Competition Law. CADE has not yet issued a regulation under the new Competition Law covering unilateral conduct, and has been resorting to legislation issued under the previous regime and precedents. The Anglo-American concept of binding judicial precedent (i.e., stare decisis) is virtually non-existent in Brazil, which means that CADE’s commissioners are under no obligation to follow past decisions in future cases. Under CADE’s Internal Regulations, legal certainty is only achieved if CADE rules in the same way at least 10 times, after which a given statement is codified via the issuance of a binding statement. To date, CADE has issued nine binding statements, all related to merger review except one (Binding Statement No. 7), which provides that it is an antitrust infringement for a physicians’ cooperative holding a dominant position to prevent its affiliated physicians from being affiliated with other physicians’ cooperatives and health plans. Although abuse of dominance could also be considered a criminal violation under Article 4 of Law No. 8,137/90, punishable in the case of individuals but not corporations by a criminal fine and two to five years’ imprisonment, no criminal sanction has to date been imposed on individuals for abuse of dominance practices. In 2017, CADE adjudicated 13 administrative proceedings. Out of these four were dismissed, while in nine cases CADE found an infringement in relation to at least one defendant. This represents a significant drop if compared to 2016, when 31 cases were adjudicated in total, out of which 19 resulted in a conviction (and an even more significant drop if we take 2015 figures into account, when 52 cases were adjudicated, resulting in 39 convictions). On the other hand, there has been an increasing number of settlements reached between defendants and CADE, totalling 70 settlements executed in 2017 (out of 75 settlement proposals). As a result, imposed fines have decreased from 196 million reais in 2016 to 95 million reais in 2017, while settlement sums agreed to be paid with CADE achieved a record 845 million reais in 2017, against 798 million reais in 2016. The increasing number of settlements and amounts collected may be explained by the fact that the authority has established a more predictable procedure for settling cases, and is devoting more resources to the prosecution of anticompetitive practices. In 2017, cartels remained a priority for CADE, accounting for most of the investigations and infringements found. All cases in which CADE found an infringement referred to cartel investigations. There was only one investigation involving concerted practices in connection with the pricing of advertising agencies and marketing services, but CADE dismissed such case due to lack of evidence of harmful effects on competition. Other CADE decisions – whether to open, settle or dismiss a case, or recommend the conviction of defendants – included exclusionary practices, namely refusal to deal, price discrimination and the creation of difficulties for market players. Listed below is a comprehensive list of 2017’s abuse of dominance cases. In 2017, CADE continued to be active in the review of alleged abuse of dominance practices in regulated industries, with a special focus on financial services, port services and natural gas. In March 2016, CADE launched administrative inquiries to investigate whether large-scale financial institutions, card issuers and payment acquirers limited competition through exclusivity arrangements and refusal to deal with competitors. The agreements were thought to reinforce the dominant position of credit card providers Cielo and Rede to the benefit of their controlling banks. Rede settled the last inquiry by undertaking to allow competitors to access its pinpads, on a non-discriminatory basis, as long as Rede was given reciprocal treatment. On 28 June 2017, Cielo and Elo also settled the cases, on similar conditions. In July 2017, CADE dismissed the investigation against Alelo, Amex and Ticket once the authority found that all of those credit card networks by themselves had succeeded in opening their processing networks to other acquirers, voluntarily ceasing all contractual and de facto exclusive arrangements with acquirers. The investigation had been closed before CADE and the Brazilian Central Bank signed a memorandum of understanding setting out a cooperation framework for both institutions, ending a long-term dispute regarding antitrust enforcement and competitive analysis in the market for financial services. On 21 March 2018, CADE made public a complaint filed by Nubank, a Brazilian fintech and card issuer, against the five major banks in Brazil: Banco do Brasil, Bradesco, Caixa Econômica Federal – CEF, Itaú-Unibanco and Santander.7 According to the allegations presented by Nubank, the banks have been creating barriers and refusing to provide Nubank with the services needed for its regular development. Moreover, Nubank argued that the banks have been jointly lobbying for banking and financial policies against fintechs. The investigation is ongoing. On 9 June 2016, the Federal Public Prosecutor’s Office filed a complaint against the four major internet service providers in Brazil (Claro, Oi, Telefônica/Viv, and TIM) due to alleged negative effects that had arisen from the practice of zero-rating8 – when an internet service provider applies a zero price to the data traffic associated with a particular application or websites, or class of applications or websites, and the data does not count towards any data cap in place on the internet access service (very common in social media and music streaming applications). According to the complaint, zero-rating practices would have the ability to distort competition among application and content providers, in the sense that all major internet service providers in Brazil only offer zero-rating for very popular applications, such as Facebook, Instagram, WhatsApp and Twitter: that is, by exempting consumers from the utilisation of some data packages, there would be incentives for the strengthening of the dominant position held by major content providers, to the detriment of small players and entrants, once consumers would be more inclined towards using apps and content on their mobile phones without any charge. On 31 August 2017, CADE dismissed the case as it found that there was no casual nexus between zero-rating and the success of the major applications and content providers: for example, the increase in the number of users and accesses to Facebook, Instagram, WhatsApp and Twitter was not dependent on zero-rating offers. Even if the investigated telecom companies ceased all offers involving zero-rating, consumers would use the aforementioned social media apps at the same intensity. Additionally, by exempting the data traffic of the most-used applications, there would be more free data packages for consumers to try and enhance their experience with new and innovative applications. Another relevant case was initiated by a complaint filed by British Telecom in December 2015, against Claro, Oi and Telefônica, which collectively own most of the telecom infrastructure in Brazil.9 In accordance with British Telecom’s allegations, the defendants refused to deal with British Telecom and, therefore, the complainant was deprived from competing on the merits in the context of a public bidding launched by the Brazilian Postal Services, Correios, with the aim of improving the networks and the interconnection among all local agencies of Correios. British Telecom also alleged that Claro, Oi and Telefônica foreclosed the market and impeded competition because they formed a consortium, and through this collectively abused their market power. CADE has been collecting evidence on the case since August 2017, when the investigation was made public. Under CADE’s scrutiny are Petrobras’ alleged preferential discounts for natural gas, under which distributors that solely traded Bolivian gas would not be granted discounts. As a result, Petrobras’ integrated natural gas distributors were given beneficial treatment, harming competing gas distributors such as Comgás, which filed the claim.10 In August 2016, the DG concluded the existence of a violation and sent the case for final judgment to CADE’s Tribunal. Judgment was still pending as of 4 April 2018. Finally, on 29 March 2018, CADE’s DG dismissed a claim presented by Âmbar Energia, an operator of thermopower plants, against Petrobras, the supplier of most of the natural gas needed for the operation of a plant located near the border region of Brazil and Bolivia.11 Following a frustrated private negotiation between Âmbar and Petrobras, Âmbar presented a claim before CADE against Petrobras, requesting the opening of an antitrust investigation. At the beginning of the case, Âmbar alleged price discrimination against it by Petrobras, which supposedly supplied thermopower plants owned by Petrobras under more favourable commercial conditions. After signing a transitory natural gas supply agreement, Petrobras terminated such agreement due to the fact that the shareholders of Âmbar executed a plea bargain with the Brazilian Federal Prosecution Service, admitting corrupt practices in connection with the negotiation of the terms and conditions of the mentioned agreement, which prompted new allegations by Âmbar of a refusal to deal. CADE’s DG dismissed the case due to lack of evidence. Additionally, the DG acknowledged that Petrobras has the discretion to terminate agreements in cases of noncompliance with anticorruption policies. On 27 June 2016, the Forum of Brazilian Hotel Operators (FOHB) filed a complaint before CADE against Expedia, Decolar.com and Booking covering most-favoured nation (MFN) and price parity clauses. According to FOHB, MFN clauses prevent hotel operators from granting lower prices to direct customers and clients, so that Expedia, Decolar.com and Booking, as the dominant price comparison websites, would always be able to provide clients with more attractive commercial conditions and room availability on internet sales platforms. On 29 March 2018, Expedia, Decolar.com and Booking settled the case with CADE and agreed to cease the use of a broad parity clause with hotel operators, preventing the price comparison websites from blocking hotel operators from granting better offers to their clients in offline and online sales channels. However, to reduce incentives for free-riding, in the event that a hotel operator is found through an online platform (such as Expedia, Decolar.com or Booking), such online platform may require hotel operators to ensure price parity to mitigate the chances of sellers and buyers connecting through online platforms but finalising transactions through other channels, with lower prices, in typical free-rider behaviour. Finally, on 14 March 2018, CADE’s Tribunal issued one of CADE’s most anticipated rulings involving an investigation into carmakers Fiat Chrysler, Ford and Volkswagen, which have been accused of abusing their intellectual property (IP) rights in the spare parts aftermarket by blocking independent makers from producing and selling certain spare parts.16 Even though in June 2016, CADE’s DG found that the conduct was illegal, recommending the imposition of a sanction, the majority of CADE’s Tribunal concluded that there was no abuse of IP rights, but only the exercise of exclusive rights granted by the Brazilian IP Law. Brazil’s Competition Law provides that a dominant position is presumed when ‘a company or group of companies’ controls 20 per cent of a relevant market. Article 36 further provides that CADE may change the 20 per cent threshold ‘for specific sectors of the economy’, although the agency has not formally done so to date. The 20 per cent threshold is relatively low compared with that in other jurisdictions, especially the United States and the EU. CADE has traditionally interpreted the expression ‘group of companies’ to encompass companies belonging to different economic groups that could jointly abuse power in a given market, even if no single member of the group holds market power on its own. The new CADE is yet to issue secondary legislation setting formal criteria for the analysis of alleged anticompetitive conduct, and the agency has been relying on regulations issued under the previous law, primarily CADE Resolution No. 20/1999. Annex II of CADE Resolution No. 20/99 sets criteria for the definition of the relevant market in terms of both product and geographic dimensions. The methodology is mostly based on substitution by consumers in response to hypothetical changes in price. The resolution incorporates the ‘SSNIP test’, aiming to identify the smallest market within which a hypothetical monopolist could impose a small and significant non-transitory increase in price – usually taken as a price increase of 5 to 10 per cent for at least 12 months. Supply-side substitutability is also sometimes considered for market definition purposes. As for measures of concentration, reference is made to both the CRX index and the Herfindahl-Hirschman Index. d engagement in market abuse. Article 36 specifically excludes from potential violations, however, the achievement of market control by means of ‘competitive efficiency’. Under Article 2 of the Competition Law, practices that take place outside the territory of Brazil are subject to CADE’s jurisdiction, provided that they produce actual or potential effects in Brazil. Article 36, Section 3o, contains a lengthy but not exclusive list of acts that may be considered antitrust violations provided they have as their object or effect the aforementioned acts. The listed practices include various types of horizontal and vertical agreements and unilateral abuses of market power. Enumerated vertical practices (they could be abusive if imposed unilaterally) include resale price maintenance (RPM) and other restrictions affecting sales to third parties, price discrimination and tying. Listed unilateral practices encompass both exploitative and exclusionary practices, including refusals to deal and limitations on access to inputs or distribution channels, and predatory pricing. Annex II of CADE Resolution No. 20/99 generally provides for the review of unilateral conduct under the rule of reason, as it might have pro-competitive effects. Authorities should consider efficiencies alleged by the parties and balance them against the potential harm to consumers. Annex I of CADE Resolution No. 20/99 defines predatory pricing as the ‘deliberate practice of prices below average variable cost, seeking to eliminate competitors and then charge prices and yield profits that are closer to monopolistic levels’. This definition specifically sets as a condition for the finding of predatory pricing and the possibility or likelihood of recoupment of the losses. Given such stringent standards, CADE has never found any conduct to be an abuse of dominance on the basis of predatory pricing. Margin squeeze may be a stand-alone abusive behaviour, and generally requires a differential between wholesale and retail prices that impedes the ability of a vertically integrated firm’s wholesale customers to compete with it at the retail level. CADE has been particularly concerned with alleged margin-squeeze practices in the telecommunications sector. d the tying practice does not generate overriding efficiencies. Annex I of CADE Resolution No. 20/99 includes refusal to deal as an example of anticompetitive practices. Brazil’s antitrust agency acknowledges that, as a general rule, even monopolists may choose their business partners. Under certain circumstances, however, there may be limits on this freedom for dominant firms to deal with rivals, particularly including refusal to license IP rights. CADE Resolution No. 20/99 considers denial of access to an essential facility as a particular type of refusal to deal. Under CADE case law, for an infringement to be found, access to the facility must be essential to reach customers, and replication or duplication of the facility must be impossible or not reasonably feasible. Annex I of CADE Resolution No. 20/99 establishes RPM as a potentially illegal conduct when it refers to either minimum or maximum prices. According to CADE, RPM may increase the risk of collusion in the upstream market and also a manufacturer’s unilateral market power. In January 2013, in a landmark abuse of dominance case, CADE sanctioned automobile parts manufacturer SKF for setting a minimum sales price.26 Pursuant to the decision, RPM will be deemed illegal unless defendants are able to prove efficiencies. An infringement will be found regardless of the duration of the practice (in this case, distributors followed orders for only seven months) and whether the distributors followed the minimum sales prices, as CADE considered such conduct to be per se illegal. Elaborating further, the reporting commissioner, Vinícius Marques de Carvalho, who later became CADE’s President, explicitly stated that a company having a low market share is not in itself sufficient reason for the authority to conclude that such conduct is legal. In its decision, the authority also notably disregarded the efficiency defence: in fact, there is no instance in CADE’s case law clearing an anticompetitive merger or dismissing an anticompetitive practice on the basis of efficiency arguments. CADE imposed a fine equivalent to 1 per cent of SKF’s total turnover in the year preceding the initiation of the investigation. This position, taken by the majority of the commissioners, departs from previous decisions issued by Brazilian authorities on RPM, and makes it very hard for companies holding a stake of at least 20 per cent of the market to justify the setting of minimum sales prices. Annex I of CADE Resolution No. 20/99 makes reference exclusively to price discrimination, even though non-price discrimination practices could also be subject to Brazil’s Competition Law provided they unreasonably distort competition. The imposition of dissimilar conditions to equivalent transactions would be deemed an antitrust violation to the extent that it is predatory or otherwise excludes competitors from the relevant market. In November 2013, the DG launched a probe into Brazil’s national postal service provider ECT for alleged abuse of dominance practices through discrimination in the market for express parcels.27 CADE’s DG recommended the imposition of fines in April 2017, but a final decision is pending. There is also an ongoing proceeding into an alleged abuse of dominance in the fuel retail market in Brazil’s Federal District.28 Petrobras Distribuidora is believed to be ensuring favourable contractual terms to petrol stations affiliated with a specific chain. CADE is still collecting evidence on this case. Unfair trading practices may, in theory, be punished under Brazil’s Competition Law. The previous Law provided as an example of anticompetitive practice the charge of ‘abusive prices, or the unreasonable price increase of a product or service’. This example was excluded from the current Competition Law because CADE has traditionally taken the view that excessive pricing would only be considered an antitrust infringement if it had exclusionary purposes. In recent years, CADE has reviewed more than 60 cases dealing with alleged abusive pricing, most of them related to pharmaceuticals, and has dismissed all of the complaints. Brazil’s Competition Law applies to corporations, associations of corporations and individuals. For corporations, fines range between 0.1 and 20 per cent of the company’s or ‘group of companies’29 pre-tax turnover in the economic sector affected by the conduct in the year prior to the beginning of an investigation. CADE Resolution No. 3/2012 broadly defines 144 ‘sectors of activity’ to be considered for the purposes of calculating the fine under Law No. 12,529/2011. In November 2016, CADE issued Resolution No. 18/2016, under which such ‘fields of activities’ may be further limited to ensure that a sanction will be proportionate to the specificities of the conduct. CADE may resort to the total turnover, whenever information on revenue derived from the relevant ‘sector of activity’ is unavailable. Moreover, the fine may be no less than the amount of harm resulting from the conduct. Fines imposed for recurring violations must be doubled. In practice, CADE has been imposing fines of up to 10 per cent of a company’s turnover in connection with abuse of dominance violations. On rare occasions (all related to cartel investigations), CADE has proceeded to calculate the harm resulting from the conduct. Other individuals and legal entities that do not directly conduct economic activities are subject to fines ranging from 50,000 reais to 2 million reais. Individuals and companies may also be fined for refusing or delaying the provision of information, or for providing misleading information; obstructing an on-site inspection; or failing to appear or failing to cooperate when summoned to provide oral clarification. At any stage of an investigation, CADE may adopt an interim order to preserve market conditions while a final decision on a case is pending.31 An interim order may be adopted only if the facts and applicable law establish a prima facie likelihood that an infringement will be found (fumus boni iuris); and that, in the absence of the order, irreparable damage may be caused to the market (periculum in mora). CADE has been adopting interim orders in connection with a significant number of solid abuse of dominance cases. The most recent was the interim measure ordered by CADE in April 2015 against the Gemini consortium, which was ordered to disclose the price of gas that it was supplied with. The new Competition Law also includes a broad provision allowing CADE to impose any ‘sanctions necessary to terminate harmful anticompetitive effects’, which allows CADE to prohibit or require a specific conduct from the undertaking at issue. Given the quasi-criminal nature of the sanctions available to the antitrust authorities, CADE’s wide-ranging enforcement of such provision may prompt judicial appeals. Under the Competition Law, CADE may order a corporate spin-off, transfer of control, sale of assets or any measure deemed necessary to cease the detrimental effects associated with a wrongful conduct. CADE has never resorted to structural remedies in connection with abuse of dominance cases. The first step of a formal investigation is taken by the DG, which may decide, spontaneously (ex officio) or upon a written and substantiated request or complaint of any interested party, to initiate a preliminary inquiry or to open an administrative proceeding against companies or individuals, or both, which may result in the imposition of sanctions. After an administrative investigation is initiated, the DG will analyse the defence arguments and continue with its own investigations, which may include requests for clarification, issuance of questionnaires to third parties, hearing of witnesses and even the conducting of inspections and dawn raids. Inspections do not depend upon court approval and are not generally used by the DG. As for dawn raids, as a rule, the courts allow the DG to seize both electronic and paper data. In 2009, a computer forensics unit was created by the Brazilian agencies for the purpose of analysing electronic information obtained in dawn raids and by other means. Over the past few years, the Brazilian authorities have served more than 300 search warrants (including for residential premises), mostly in connection with cartel investigations. Once the DG has concluded its investigation in the administrative proceeding, the defendants may present final arguments, after which the DG will send the files for CADE for final ruling with a recommendation to impose sanctions against the defendants or to dismiss the case. At the Tribunal, the case is assigned to a reporting commissioner. While the reporting commissioner reviews the case, CADE’s Attorney General may issue an opinion on it. The reporting commissioner may also request data, clarifications or documents from the defendant, any individuals or companies, public entities or agencies prior to issuing its opinion. After doing so, the case is brought to judgment before CADE’s full panel at a public hearing, where decisions will be reached by a majority vote. CADE may decide to dismiss the case if it finds no clear evidence of an antitrust violation, or impose fines or order the defendants to cease the conduct under investigation, or both. CADE decisions are subject to judicial enforcement if they are not complied with voluntarily. At any phase of the proceeding, CADE may enter into a cease-and-desist commitment (TCC) with the defendant whereby the defendant undertakes to cease the conduct under investigation. Should a defendant enter into a TCC, it will not necessarily result in an admission of guilt as to the practice under investigation, nor necessarily require the payment of a settlement sum. The case is put on hold if and to the extent that the TCC is complied with, and sent to CADE’s archives after a predetermined time if the conditions set out in the TCC are fully met. Finally, Brazil has been increasing its cooperation with foreign antitrust agencies. In February 2009, SDE, Brazil’s former administrative antitrust investigative agency, and Brazil’s federal police launched the first simultaneous dawn raid in connection with an international cartel investigation together with the US Department of Justice and the European Commission. Brazil’s antitrust authorities have executed cooperation agreements with the US Department of Justice, the European Commission, Argentina, Canada, Chile, China, Colombia, Ecuador, France, Japan, Peru, Portugal, Russia and South Korea, among others. CADE has in a number of instances requested the assistance of foreign authorities to conduct an investigation and, more recently, with the increasing number of dawn raids, foreign authorities have become interested in evidence seized in Brazil. However, in most of the cases, cooperation takes place in relation to cartel investigations rather than in abuse of dominance cases. CADE has also entered into cooperation agreements with the World Bank Group, and the Inter-American Development Bank, allowing for the exchange of information and for consultations on matters of common interest. Private antitrust enforcement in Brazil34 has been on the rise over the past five years. This may be due to reasons such as the global trend of antitrust authorities encouraging damage litigation by potential injured parties, the growing number of infringement decisions issued by Brazil’s antitrust agency, CADE and the increasing general awareness of competition law in Brazil. Apart from complaints based on contracts, a significant percentage of private actions are based on horizontal conduct in Brazil. As in other jurisdictions, both corporations and individuals may be sued individually (e.g., by competitors, suppliers, or direct or indirect purchasers) or collectively for antitrust violations, but the greatest majority of pending cases are against corporations. The pass-on defence is not applicable to misconduct against consumers;36 for other cases, there are no statutory provisions or case law issued to date. Individual lawsuits are governed by the general rules set forth in the Brazilian Civil Procedure Code. Collective actions are regulated by different statutes that comprise the country’s collective redress system. Standing to file suits aiming at the protection of collective rights is relatively restricted, and only governmental and publicly held entities are allowed to file. State and federal prosecutors’ offices have been responsible for the majority of civil suits seeking collective redress, most of which have been related to consumers’ rights complaints. The drafts are generally in line with international best practices, and reflect CADE’s efforts to strike a balance between the two goals. However, there is room for improvement regarding some aspects of the Draft Resolution and of the Proposed Legislation, and in particular on the need for CADE to change the approach adopted in the Proposed Legislation regarding the triggering event for the statute of limitation for damage claims. There are two major, and conflicting, trends currently contributing to defining CADE’s stance in abuse of dominance cases. The first is the increasing availability of apparatus that enables the competition authority to employ economic analysis and evidence. The use of economics in Brazil has grown dramatically in competition matters over recent years, and is expected to play a major part in every important abuse of dominance case. The creation of the Department of Economic Studies within CADE by the 2011 Competition Law is certainly a watershed event in that respect. Nonetheless, some recent cases seem to point to a second trend that is apparently at odds with the ever-growing sophistication of competition analysis. That trend could be defined as an enhanced scepticism or outright disregard for the role of efficiencies in vertical practices. The reason the latter trend is counterintuitive and somewhat paradoxical in light of the larger role currently played by economics in antitrust analysis is obvious: standard economic analysis would recommend caution against ‘over-enforcement’ regarding unilateral conduct. Still, it seems CADE has not been (and will continue not to be) shy about intervening. It will be very interesting to follow future developments and see the interplay of those two undercurrents: it can be hoped that in the end they will balance out and we will have a CADE that is more proactive but still selective in the abuse of dominance arena. Guidelines on vertical restraints and recommended commercial practices for dominant firms would ensure legal certainty and allow more predictability for market players when designing their commercial practices. Furthermore, the intervention of rivals and customers as third parties in cases pending before CADE with more aggressive approaches, the issuance of injunctions for ceasing potentially harmful practices before a final decision is issued by the agency, as well as the imposition of behavioural remedies in the context of vertical mergers to reduce the incentives for future market abuses, are expected to increase in the coming years. 1 Ana Paula Martinez is a partner at Levy & Salomão Advogados. The author would like to thank Lucas Griebeler da Motta for conducting the research needed to update this chapter. 2 Brazil’s antitrust system features both administrative and criminal enforcement. The administrative and criminal authorities have independent roles and powers, and may cooperate on a case-by-case basis. Private enforcement actions may also be initiated through the judicial courts by aggrieved competitors or damaged parties. At the criminal level, antitrust law and practice is governed mainly by Law No. 8,137/1990 (Economic Crimes Law), as amended by Law No. 12,529/11, and Law No. 8,666/1993 (Public Procurement Law). 3 On average, judicial courts confirm over 70 per cent of CADE’s decisions. 4 Administrative inquiry No. 08700.000018/2015-11. 5 Administrative inquiry No. 08700.001860/2016-51. 6 Administrative inquiry No. 08700.001861/2016-03. 7 Administrative inquiry No. 08700.003187/2017-74. 8 Administrative inquiry No. 08700.004314/2016-71. 9 Administrative inquiry No. 08700.011835/2015-02. 10 Administrative inquiry No. 08700.002600/2014-30. 11 Administrative inquiry No. 08700.009007/2015-04. 16 Administrative proceeding No. 08012.002673/2007-51. 17 Administrative proceeding No. 08012.010576/2009-02. 18 Administrative proceeding No. 08700.009890/2014-43. 19 Administrative proceeding No. 08700.001743/2014-25. Settlement proposal No. 08700.010029/2015-17. 20 Administrative proceeding No. 08012003805/2004-10; defendant: Companhia de Bebidas das Américas – Ambev; adjudication date: 22 July 2009. The amount of the fine was equivalent to 2 per cent of the total turnover of the defendant in the year preceding the initiation of the investigations. 21 Another alleged exclusionary case involving AmBev concerned an alleged practice to raise rivals’ costs by introducing a proprietary reusable bottle in the market. Much of the beer sold in Brazil is packaged in reusable bottles. The bottles have a standard size (600ml), allowing all market players to coordinate their recycling (for reuse) programmes. AmBev introduced a 630ml proprietary bottle, which was physically very similar to the 600ml bottle, allegedly causing confusion in the recycling programme of rivals and raising costs for points of sale that also offered AmBev’s competitors’ products. In November 2010, AmBev agreed to stop commercialising the 630ml bottle through a consent decree with CADE (administrative proceeding No. 08012.001238/2010-57). 22 Administrative inquiry No. 08700.007338/2013-30. 23 Administrative inquiry No. 08012.002019/2006-67; defendants: Confederação Brasileira de Futebol, Irontour Agência de Viagens Ltda. – Planeta Brasil. 24 Administrative proceeding No. 08012.008855/2003-11. 25 Administrative proceeding No. 08012.010208/2005-22. 26 Administrative proceeding No. 08012.001271/2001-44; defendant: SKF do Brasil Ltda; adjudication date: 30 January 2013. 27 Administrative inquiry No. 08700.009588/2013-04; defendant: Empresa Brasileira de Correios e Telégrafos – ECT. 28 Administrative proceeding No. 08012.005799/2003-54. 29 The wording of the new provision lacks clarity and creates legal uncertainty regarding the scope of its application. CADE was expected to issue a regulation defining the criteria that would be applied to distinguish when fines would be imposed against a company, a group of companies or a conglomerate, but has not yet done so. 30 Administrative proceeding No. 08012.010028/2009-74; defendants: Felipe Szpigel, Bernardo Pinto, Paiva, Rodolfo Chung, Ricardo Tadeu, Marcelo Miranda and Marcelo Costa. 31 Article 87 of the Competition Law. 32 In 2012, CADE, for the first time, imposed this sanction in connection with an abuse of dominance case (see administrative proceeding No. 08012.001099/1999-71; defendants: Comepla Indústria e Comércio et al; adjudication date: 23 May 2012). 33 The idea behind this provision was to deal with situations in which CADE prohibited the wrongdoer from participating in public procurement procedures and obtaining funds from public financial institutions for up to five years. To avoid this penalty, the parties simply set up a new company and resumed activities in the same sector without being subject to the restrictions imposed by CADE’s decision. 34 A more detailed version of this section was published in CPI Antitrust Chronicle, ‘Private Antitrust Enforcement in Brazil: New Perspectives and Interplay with Leniency’, Mariana Tavares de Araujo, Ana Paula Martinez, 16 April 2013; www.competitionpolicyinternational.com/private-antitrust-enforcement-in-brazil-newperspectives-and-interplay-with-leniency. 35 Punitive damages are not expressly provided for in the Competition Law, but some plaintiffs have been awarded those as well. 36 See Brazil’s Consumer Protection Code, Article 25.